Recommanded by L’AFPRAL et l’Association Française de l’Eczema. « I spent very stressful nights with my daughter for 2 and a half years. It was a nightmare! She woke up several times each night because of her eczema. She scratched herself to bleed and started crying due to the pains. I jumped out of my bed to go and see her, change her clothes, disinfect and dress her wounds, then change the sheets of her bed. Once calmed, I fed her in my arms while singing a song to make her sleep. Then I went back to bed, for 2 or 3 hours until she starts to scratch again and then I got up one more time to start it all over. At this time, the only solution was to soothe her just a little so she could sleep a few hours. It was very difficult! I was so scared that she was scratching her skin in her bed all alone and that her skin will become infected again. I could not sleep anymore quietly, to see my daughter suffering. I could hear her scratching through the walls! I was worried all the times and ready to jump out of my bed, there was no resting time for our family. That’s why I created the Maluna anti-scratch pyjamas , to protect my child’s skin during sleep. Her whole body was now covered, from neck to toes, and she and me felt safe now and ready to sleep peaceful the whole night. Her skin could heal progressively now. That would have been impossible without the pyjama that covered her body and her hands. Night after night, Pauline was getting better and better. Her skin healed and her patches diminished as well as eczema attacks were less and less frequent until disappearing completely during certain periods. 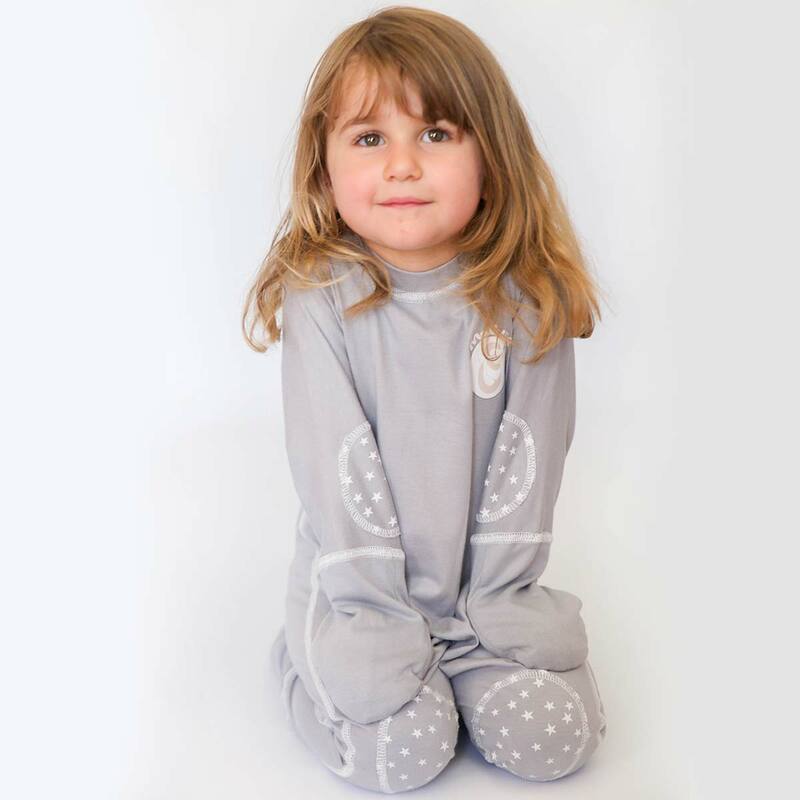 Maluna anti-scratch pyjamas help children with eczema and those who suffer from itching to sleep peacefully so that they have more energy and are less irritated during the day. The pyjamas protect the skin by preventing the child from scratching until he bleeds. The pain is often what causes the child to wake up during the night. Not only will you avoid superinfections, but you will also not need to change the sheets during the night! Finally – a peaceful night’s sleep for you too! 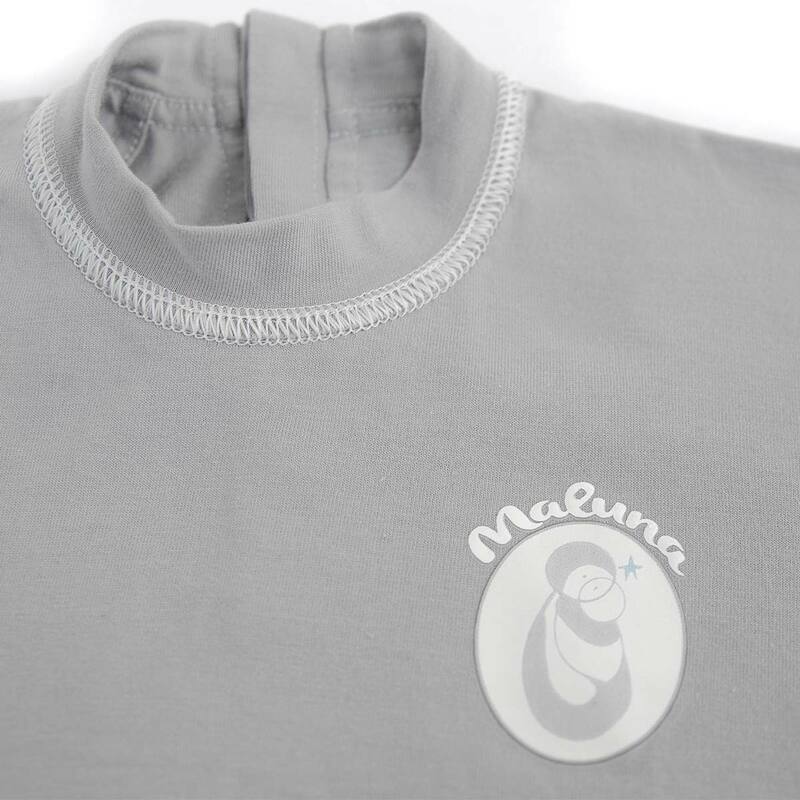 Maluna clothing can be worn all year round, in summer and winter. The cotton material allows the skin to breathe. Our clothes have the same thickness and quantity of fabric as a T-shirt! Maluna anti-scratch pyjamas are produced in soft cotton certified OEKO-TEX CLASS 1, which allows your baby’s skin to breathe. All seams are flat and on the outside to protect the skin from irritation. Lined button placket: In addition to the nickel-free buttons we use on our pyjamas, the lining also prevents contact with the skin and reduces the risk of an allergic reaction for even greater sleeping comfort. The hands and wrists have added protection with mittens made of two layers of material to keep your child’s nails away from the skin. Lined socks provide extra protection for the child’s feet, an area that is prone to skin cracks due to eczema, especially at the ankles. 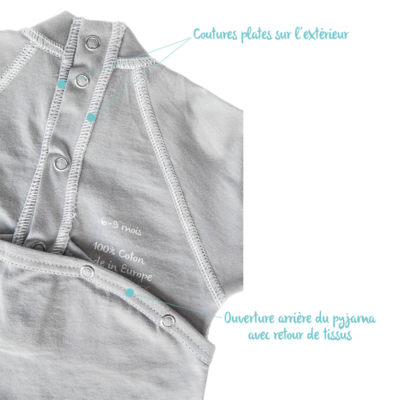 Folded rear opening: The pyjamas have a fold in the fabric at the rear opening, forming a pocket that prevents the baby from sliding his hand inside the pyjamas. The areas that children with eczema typically scratch, such as the inside of the elbows, are protected by additional patches of material. 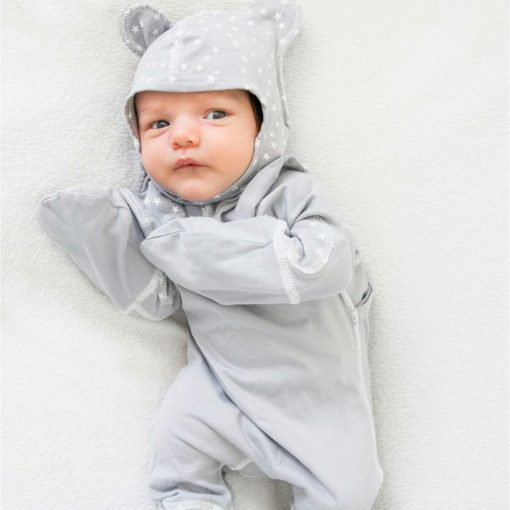 The fit of the pyjamas is loose enough to be worn over a wound dressing, bodysuit or pullover, but just snug enough to prevent friction between the material and the skin. 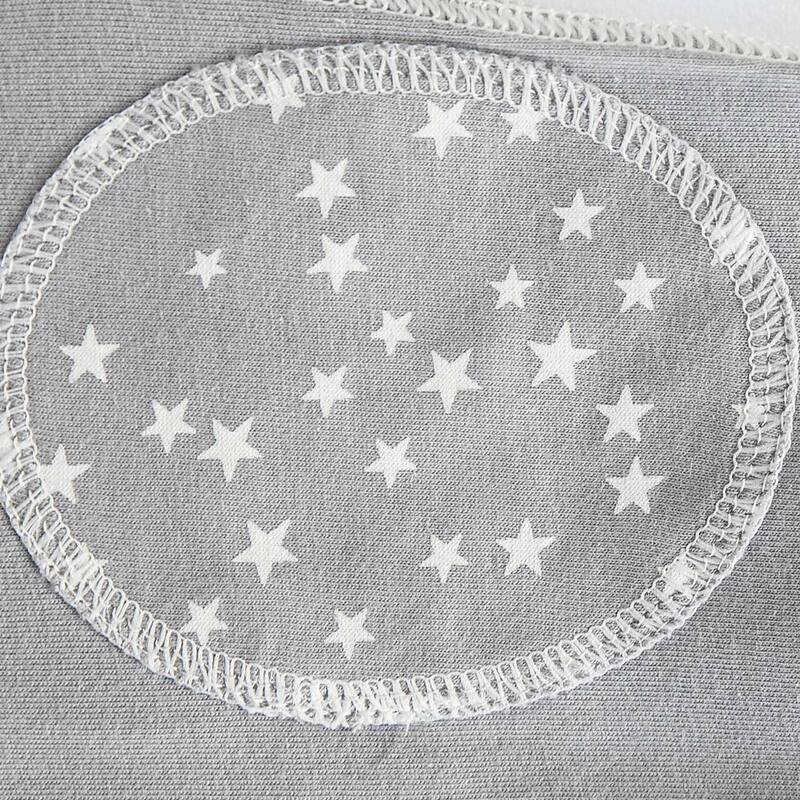 The logo and care instructions are printed on the outside of the garment. There are no labels sewn inside that could cause itching or irritation. Our models are washable at 60°C for maximum hygiene. 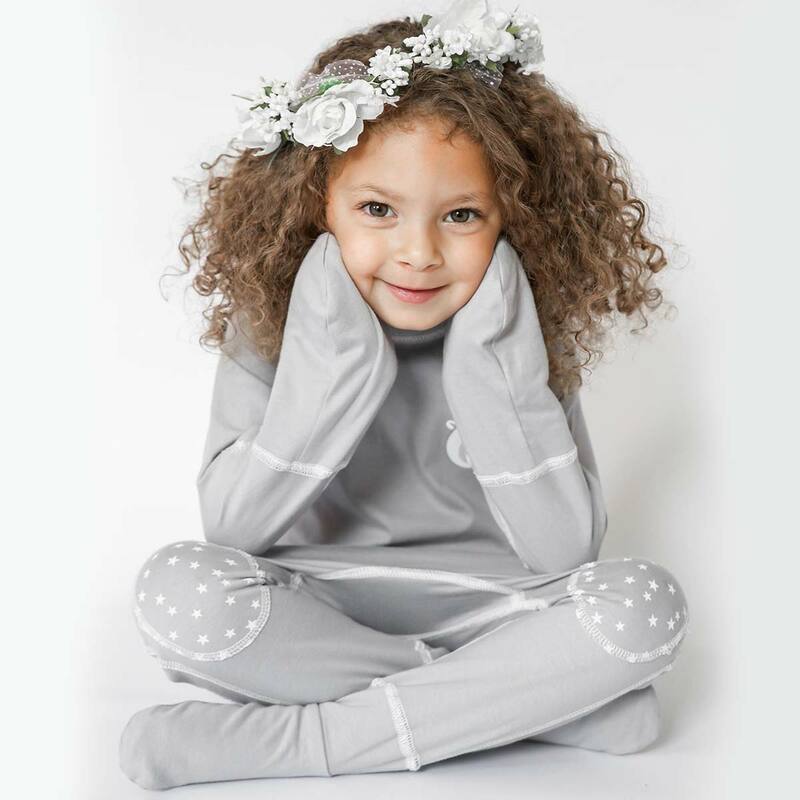 Help children fight Eczema by sharing this pyjamas on your socialnetworks! 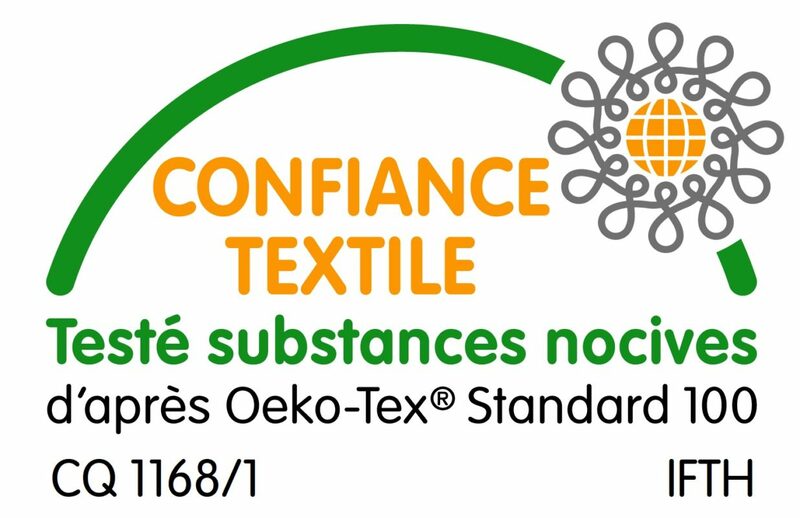 Maluna clothing is certified OEKO-TEX Standard 100 class 1. Certification by this independent label means that the raw materials used in production are strictly controlled, eliminating the risk of allergies and irritation and ensuring maximum skin tolerability. It is a guarantee of comfort and quality for you. What a pleasure to see Sophie smiling again and relaxed in the morning when I get out of bed. She finally sleeps through the nights and so do we! 🙂 Thank you for this beautiful idea! We hope that Maluna also offers larger sizes for teens, because our big girl also suffers from eczema.